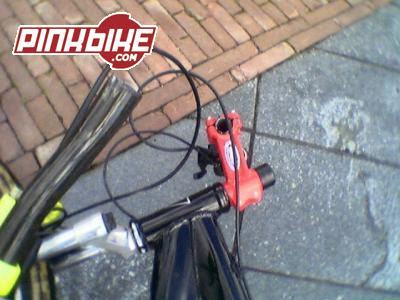 Thelonerider from the UK posted this picture of his broken bars on Pinkbike. This Scott Ransom belongs to Ruaibreu of Portugal. He does say what he did, but I'm guessing it didn't just fail as he was riding along. Here is pic of my Kestrel after a run in @ 28 mph with a 70# German Shepherd pup. 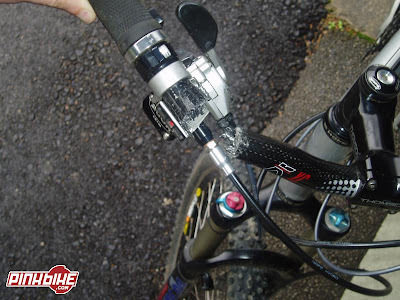 I was running a Spinergy Rev-X in front that came out relatively unscathed (dog hair caught between spokes). When I came to, the dog's owner was holding a towel on my chin. Lots of blood! 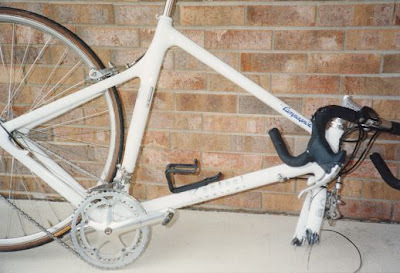 Since the crash, that Kestrel was riden another 15,000 miles. Ouch. 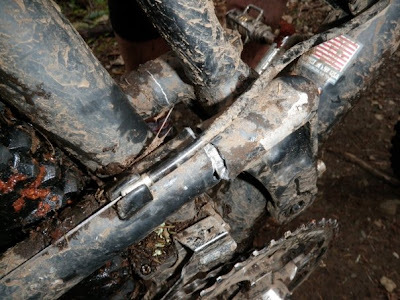 I wouldn't have thought a Rev-X was stronger than a carbon fork. Anyway, I'm glad Jim was ok.
Ouch. That's a lot of money to spend on a bike. I just got a new mountain bike this weekend with a carbon handlebar. I wonder how long until it looks like this. 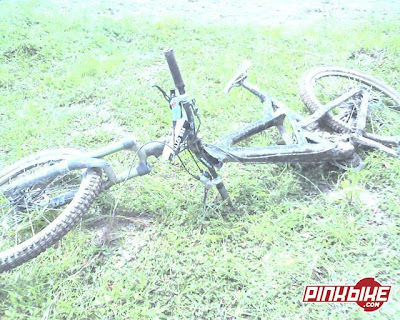 Photo from Pinkbike. 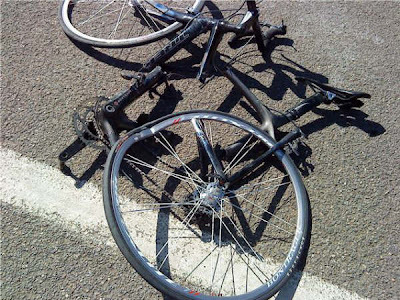 Amazingly the rider is ok. Descending a steep windy grade and the truck had crossed the centerline. 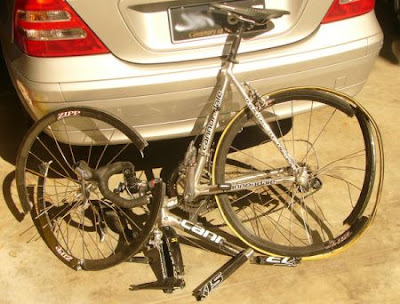 SRAM Carbon derailleur cage -- busted! 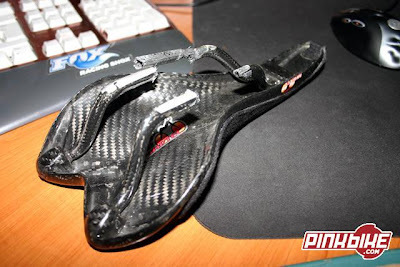 Someone over at Pinkbike.com broke his carbon seat rails. 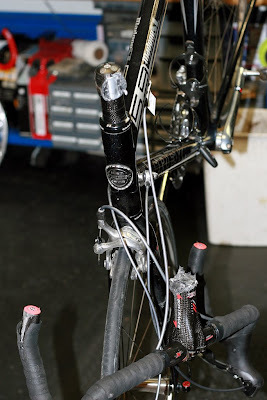 Carbon stems are usually pointless; just as heavy as aluminum, more expensive and they break. Broke during a ride this morning. 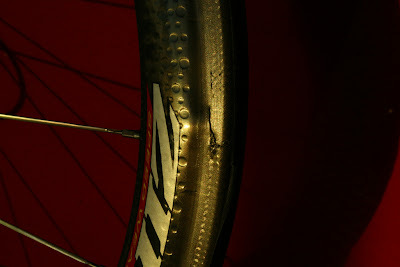 Cracked across the rim and looks like the top layer of carbon is peeling away... going to have to send them back to Zipp. Hopefully Zipp helps him out. 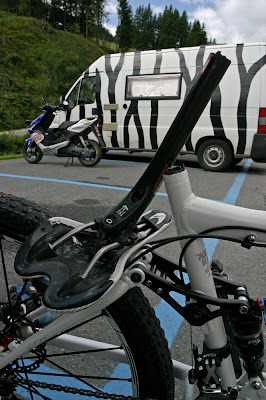 As more carbon appears on mountain bikes, more mountain bikes appear on this blog. I have no idea what happened to this bike. 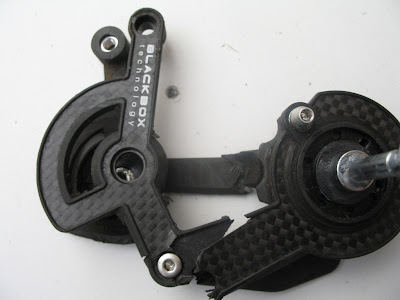 It looks like ever carbon piece is broken. These are pictures of Jen's Salsa Las Cruces. She hit a curb riding in the dark and broke her frame in half. 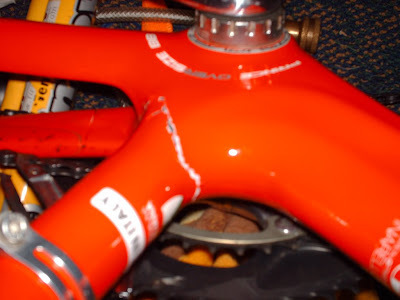 You'd think a cyclocross frame should be able to handle hitting a curb. Thankfully, she is ok. Scandium isn't as strong as other aluminum alloys, so maybe it's time I started a new blog, snapped scandium?